Dreaming of a timeshare holiday in one of the top global locations but unsure of which company to choose? Travel and Leisure Group timeshare brokers can attest that Vacation Village is amongst the best of them. This particular developer can trace its roots back to the mid-seventies, when founder James Lambert first began marketing timeshare properties. Over nearly two decades the company progressed and grew to become one of the industry giants before being transferred to employee ownership. This means that more than three thousand company employees now have a stake in the company for which they work – and it’s easy to see why over seven hundred of them have been there for more than a decade! No matter which of the Vacation Village resorts you choose, you can be assured of top quality accommodation, amenities, and that most important factor of all: location, location, location. This company’s mission is focused on your comfort, providing excellent value, and being flexible enough to suit your holiday needs. They know that your holidays should be affordable and fun every single time, and there’s certainly a reason that over four hundred thousand people trust the Vacation Village brand! Location choices stretch far and wide across the mainland United States. You could opt for splendour, opulence, and the big city lights by placing yourself at The Grandview at Las Vegas. With its close proximity to the famed Las Vegas Strip, you can’t go wrong! Alternatively, set up camp at Vacation Village in the Berkshires, an ideal location for taking in the very best of traditional New England architecture, custom, and charm. For a fun-filled getaway, consider Vacation Village at Bonaventure. Its setting in the very heart of a dedicated leisure community offers privacy, comfort, and an unrivalled proximity to Fort Lauderdale’s beaches and attractions. For all of this and much, much more, it would certainly be wise to consider timeshare with Vacation Village! Vacation Village The Grandview at Las Vegas in Nevada, USA is as fun and bewitching as The Strip itself. More than two thousand timeshare accommodations sprawl in eight buildings, with one- and two-bedrooms apiece. Travel and Leisure Group timeshare brokers love the common foyer with private access from every suite. It covers sixteen hundred square feet of living space; perfect for relaxation, enjoyment, or entertaining. Ceramic tiles line the separate lounge fitted with a TV and DVD player while the dining area is large with a complete kitchen. Rooms have Wi-Fi, a king bed and queen sofa bed and another TV. There is also a walk-in shower with hot tubs and hair dryers. Further, go deep into your holiday by unwinding in the five heated pools with hot tubs, splash pool, and lounge chairs. There are ten barbecue grills on site too, along with a 9-hole golf course, arcade and game room, gym, computer centre, and ATM. A free shuttle service to The Strip is available too where you can watch fabulous shows or drop in any of the famous casinos. A dizzying array of restaurants, shopping, and activities also await you just six miles from Vacation Village The Grandview at Las Vegas. For more information about timeshare for sale at Grandview At Las Vegas click here. A timeshare ownership in Kissimmee, Florida can only mean one thing - theme parks. For parents seeking to win the Father and Mother of the Year Award, there is no greater accommodation than Vacation Village at Parkway. It is only minutes away from Disney's Magic Kingdom, Universal Studios, and Sea World to the delight of the children. However, this expansive resort of over twenty tall buildings has more in store. Travel and Leisure Group timeshare brokers believe it will be a challenge to leave the resort and its massive pool complex with six heated outdoor pools, six hot tubs, and two children's pools. There are also pool activities and a playground on-site, plus more than twenty barbecue grills, scheduled theme park shuttle service, and two nature walks open for everybody. No doubt, Vacation Village at Parkway is all about sun and fun. And when you finally need to recharge, gather the family and retreat in any of the over two and a half thousand cosy rooms. Casual and comfortable, the one and two bedroom units are equipped with a complete kitchen, lounge, flat-screen TV with DVD player, Wi-Fi, dining room, and furnished patio. Upgraded rooms feature a West Indies inspired decor and add a pull-out sofa and whirlpool. For more information about timeshare for sale at Vacation Village At Parkway click here. The tropical ambience of Vacation Village at Bonaventure is so great you would think you are in a farther and more exotic land than Florida. Luxurious, quiet, and private, this resort is located within the South Florida Spa, Tennis and Golf Community of Weston yet is never too far from the beautiful beaches and activities of Fort Lauderdale. Fine dining establishments, exquisite shopping, and Everglade tours are also nearby. However, Travel and Leisure Group timeshare brokers find that outside indulgences will have to wait as timeshare guests are often occupied luxuriating in the in-house facilities including five heated outdoor swimming pools, a hot tub, children's pool, poolside activities, and barbecue grills and picnic areas. A playground is also on site, plus a business centre, gym, and laundry. Free parking and shuttle service on property and within a three mile radius are available, too. Meanwhile, the six hundred and fifty-three units at Vacation Village at Bonaventure are equally pleasant. The one- and two-bedroom suites are spacious and plush with modern conveniences to bring you utmost comfort. Accommodation features include living and dining areas, complete kitchen, king or queen beds, hot tubs, flat-panel TV and DVD player, Wi-Fi, full bathroom with hair dryer, and furnished balconies. For more information about timeshare for sale at Vacation Village At Bonaventure click here. The USA has so much to offer that it can be difficult deciding where to buy that timeshare, but Travel and Leisure Group timeshare brokers particularly love the Sunshine State as an option. Whether you want to relax with your partner, bring the whole family, or even embark on a solo trip to meet people and have a good time, Florida is the place for you. Vacation Village at Weston is something a little different, a timeshare resort that is actually a community, a village that you can visit and know that you will feel right at home. Your lakefront condo comes fully equipped, so you can be sure of having all the comforts of your own home right here in this wonderful location. There is a kitchen with microwave and tea and coffee facilities, a balcony from which to admire the lovely view, and the facilities are superb. With an outdoor pool and a health club, there is plenty to keep you active and enjoying the weather. Vacation Village at Weston is an excellent place to visit if you prefer to feel at home on your holidays, rather than just another guest at a nameless hotel! You will fit right in and see the same friendly faces every time you manage to visit. For more information about timeshare for sale at Vacation Village At Weston click here. Vacation Village Mizner Place at Weston Town Center is a wonderful choice for a timeshare property as Florida has so much to offer for holidaymakers. With ample amusement parks, beaches, and sunshine, the people are happy and relaxed and you can be too. There is always something to amuse, and a way to spend your time, and Travel and Leisure Group timeshare brokers love the laid-back atmosphere of the state; it can't found any other place in the USA. Located near Fort Lauderdale, these one- and two-bedroom properties have ample space for the whole family. Know that you will all have more than enough space and you won't be living on top of each other the way many resorts expect you to! The apartments are well appointed and some even have whirlpool bathtubs to really help you let go of any stress from your everyday life. The facilities are amazing, with an outdoor pool and a hot tub, and morning coffee is included in the price as the resort recognises it as a necessity. There are also opportunities to get to know the neighbours at the family pool parties, dance lessons and movie nights that Vacation Village Mizner Place at Weston Town Center puts on to make you feel at home. This really is a holiday for the whole family! 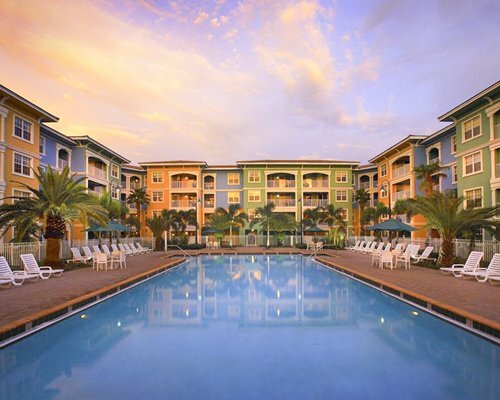 For more information about timeshare for sale at Mizner Place click here. Everyone having a vacation in Florida gets to experience the Atlantic but it is only at Vacation Village Palm Beach Shores Resort in Riviera Beach where you experience this vast ocean via your own private beach. Travel and Leisure Group timeshare brokers could not ask for a more stunning location. Every day, timeshare owners wake up to the musical lapping of the waves and the stunning views of Singer Island. The courtyard pool area is picture postcard-worthy, too. Whether you take long walks along the beach or stay inside the resort, the paradisiacal holiday comes to you through first-class facilities including a heated outdoor pool with hot tub and lounge chairs, selection of aquatic activities, restaurant and Tiki Bar, nail salon and spa, gym, game room, and Wi-Fi. Equally luxurious are the accommodations at Vacation Village Palm Beach Shores Resort. Each features two plush suites with a furnished balcony opening to sensational views. Guests enjoy a separate lounge with an entertainment centre including cable TV and DVD player, gaming console, and movies on demand. There is a dining area and complete kitchen, too. Rooms add a king bed with a queen sleeper sofa and oversize bathrooms. Ceramic tile and carpeted floors complete the abode. For more information about timeshare for sale at Palm Beach Shores Resort And Vacation Villas click here.